Yet while Moscow's appetite for gold, which has doubled Russia's international gold reserves over the past three years, remains unparalleled, Beijing has also quietly joined its northern neighbor in casting a smaller if just as material vote of no confidence in the dollar: overnight, the PBOC reported that the world’s second-largest economy added to its gold reserves for the fourth straight month, adding to recent speculation that central banks globally will continue to build holdings even as they dispose of their US dollar reserves. According to the latest Chinese reserve data, the country's gold reserves rose to 60.62 million ounces in March from 60.26 million a month earlier, according to data on its website. This was the fourth consecutive month of gold increases: last month’s inflow was 11.2 tons, following the addition of 9.95 tons in February, 11.8 tons in January and 9.95 tons in December. 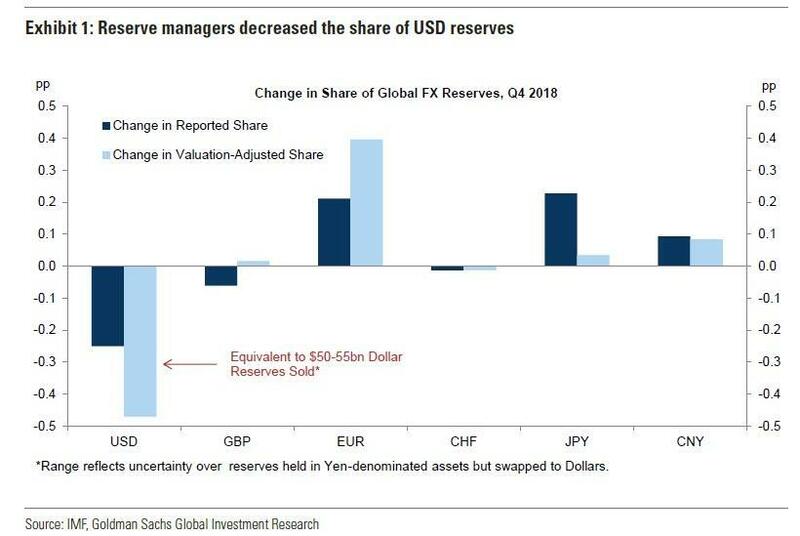 As shown in the chart below, the recent buying spree resumed after a 25 month hiatus, as China stopped reporting gold purchases in October 2016. 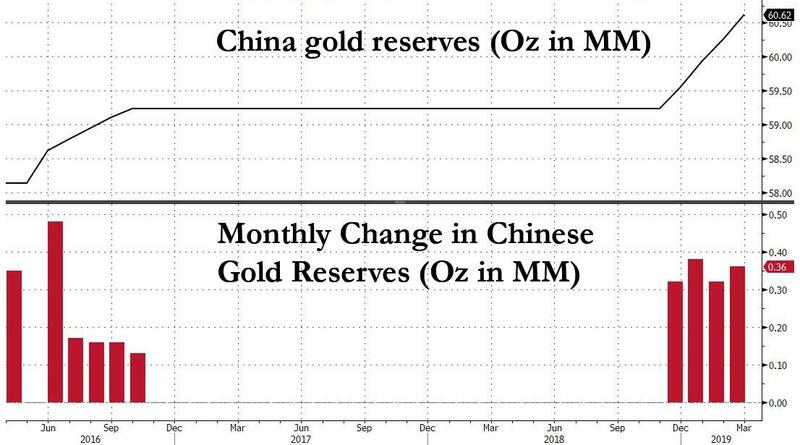 This trend broke in December, when Beijing announced it had once again started accumulating gold. 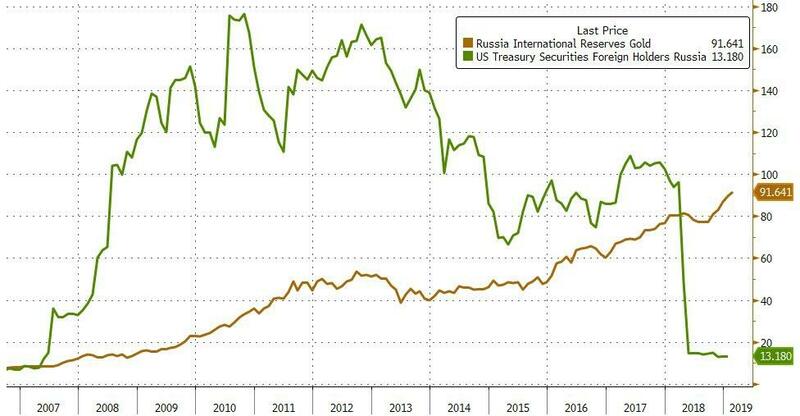 Two observations are worth making here: if China continues to accumulate physical gold at that pace over 2019, it will likely end the year as the top buyer after Russia, which added 274 tons in 2018. 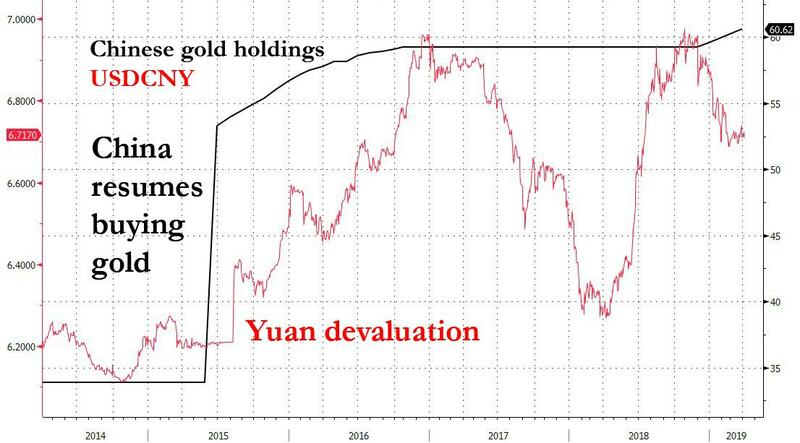 More important, however, is that the last time China resumed its gold purchases, was just three months before China's August 2015 yuan devaluation, which also unleashed a period of dramatic yuan volatility and Chinese economic weakness. 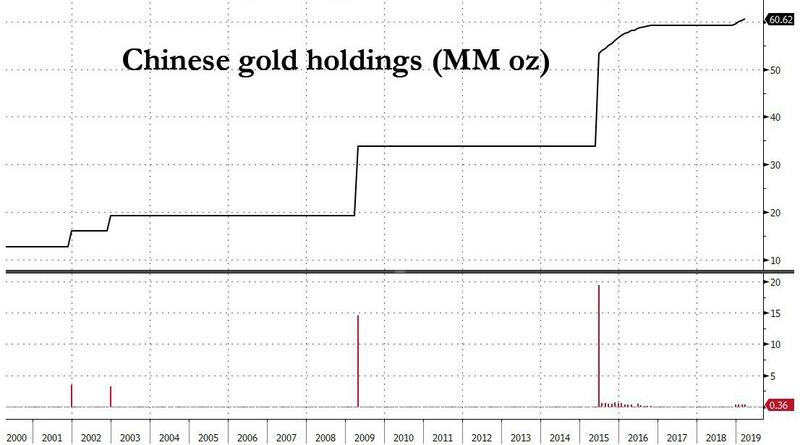 And since for China it is all about signaling - most analysts know that Beijing has been buying gold, it just hasn't been disclosing this - the question is what exactly is the recent resumption of China's gold buying meant to signal to the rest of the world? Meanwhile, until we find out, the world's isn't sitting on its hands, as governments worldwide added a whopping 651.5 tons of bullion in 2018, the second-highest total on record, according to the World Gold Council, and nobody more so than Russia which quadrupled its reserves within the span of a decade amid President Vladimir Putin’s quest to break the country’s reliance on the U.S. dollar. Is China next?